We’ve partnered with Vital Proteins to create this recipe. Thank you for supporting our sponsors. Sometime around September every year I start to get the craving for marshmallows. Whether it be in a mug of hot cocoa, roasted over a campfire or just eaten by themselves (total guilty pleasure), marshmallows are the ultimate cold weather treat. 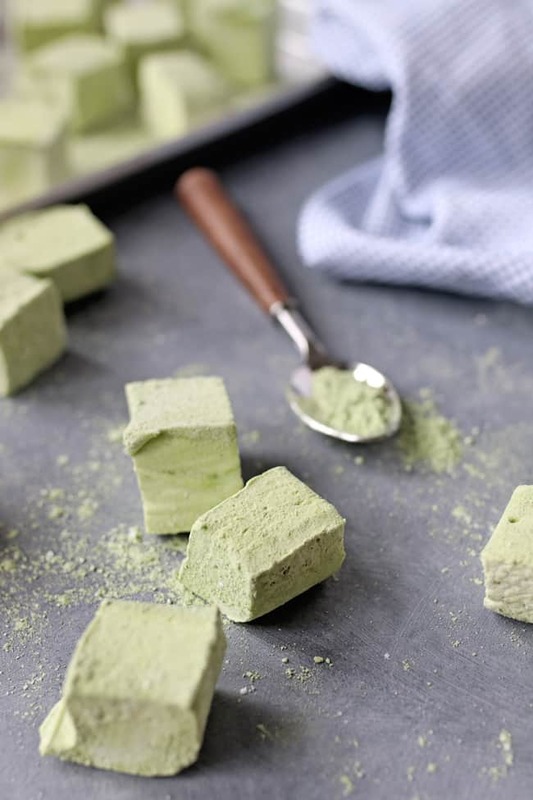 While I have taste tested my fair share, I keep coming back to these matcha marshmallows. They’re deliciously earthy with a slight hint of tea. And they’re super soft and pillowy—just like homemade marshmallows should be. Plus, they’re easy to whip up and they toast like a dream. The best part is that they’re loaded with antioxidants, amino acids and collagen, so you might even say they’re kind of a health food. 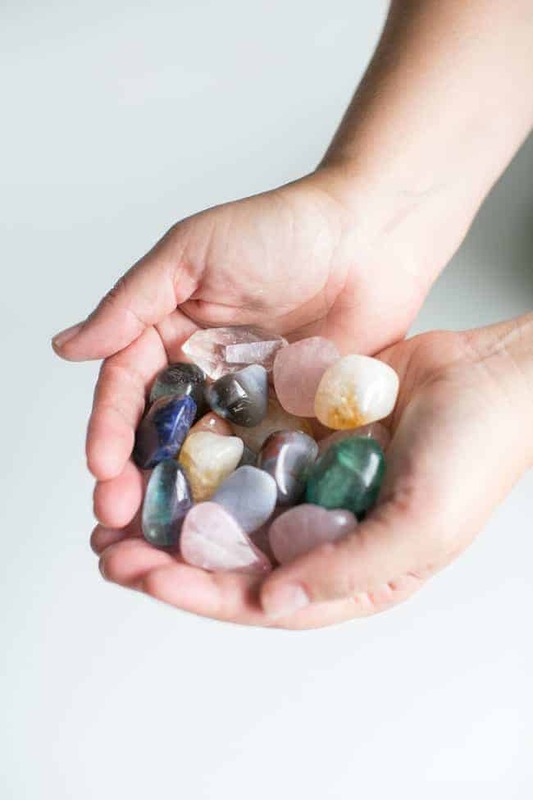 Don’t be afraid to enjoy them around the fireplace or dip them in our glowing skin hot chocolate while you wait for Saint Nick to hurry down the chimney. There are a lot of reasons to incorporate matcha into your diet, but one of the most important is its incredible nutritional profile. 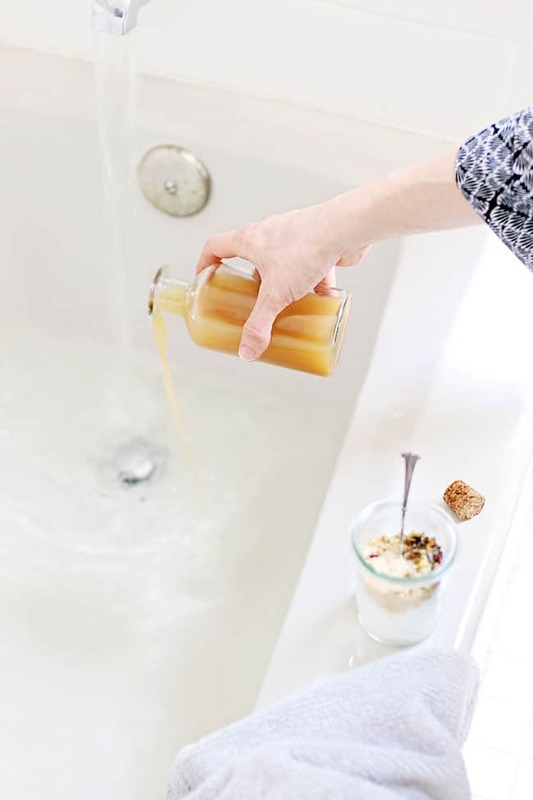 Because matcha is whole leaf tea, it’s loaded with antioxidants (some studies say over 130 times more than regular green tea), which help reduce oxidative stress caused by free radicals. 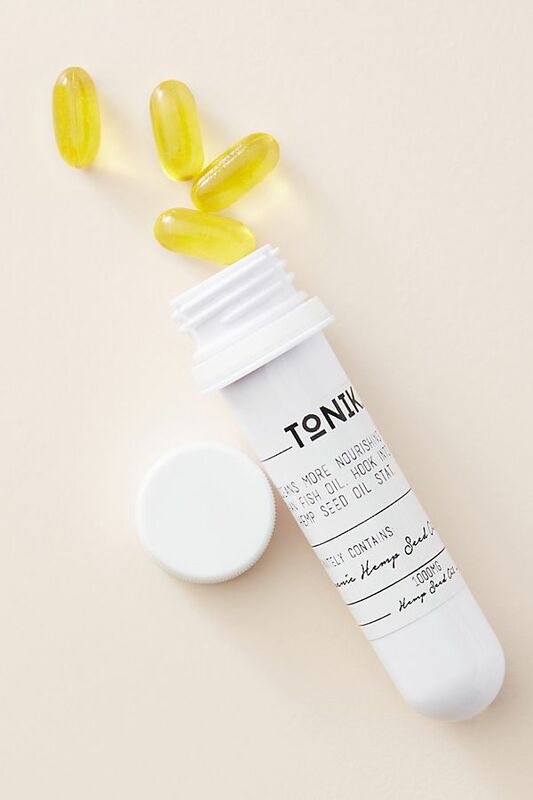 It also contains large doses of L-theanine, an amino acid that gives your mind a calm awareness. 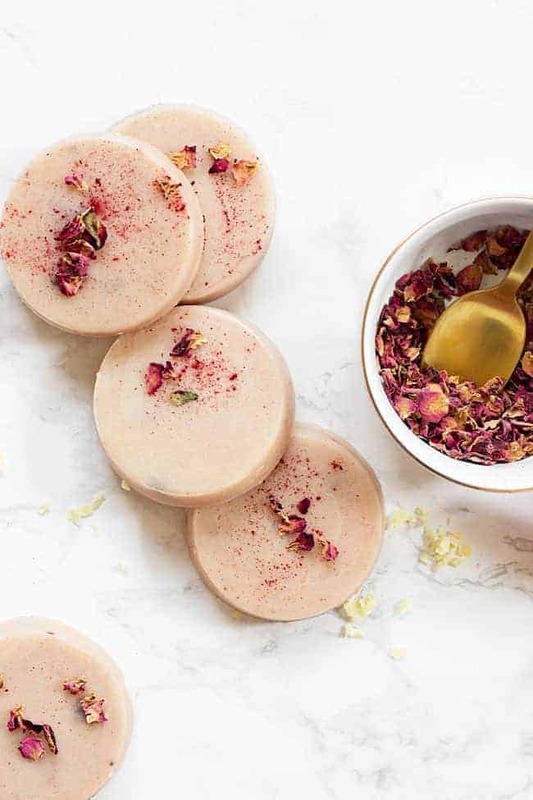 Although it does contain caffeine, matcha doesn’t cause the increased heart rate like you get from espresso or coffee and it’s much gentler on your liver. What I love about matcha is the serene alertness it brings. I usually enjoy a cup in the morning before I meditate, but I’m always looking for more ways to consume this Japanese wonder throughout the day. 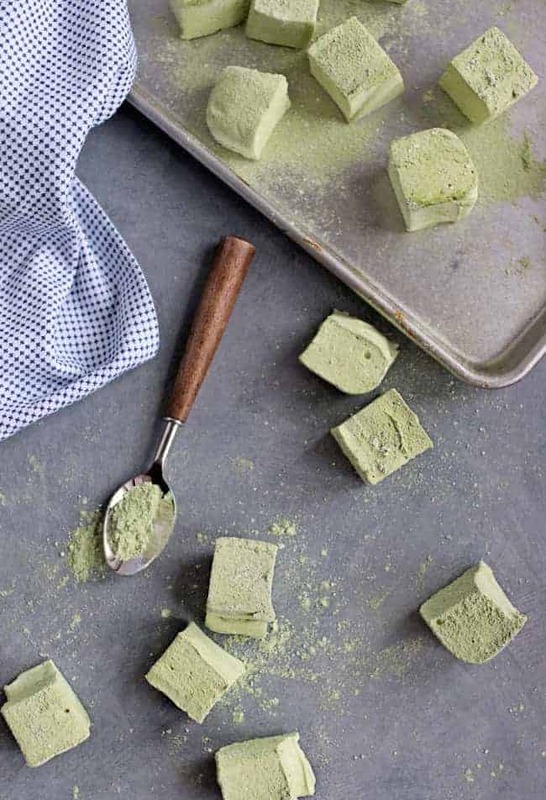 Needless to say matcha marshmallows are a no-brainer this time of year. 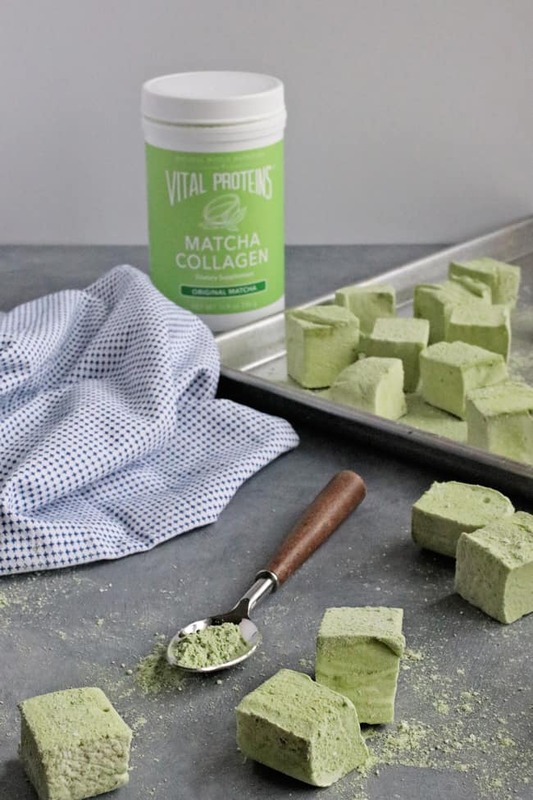 I’m a huge fan of Vital Proteins Matcha Collagen—not just in my marshmallows but also in my cup. 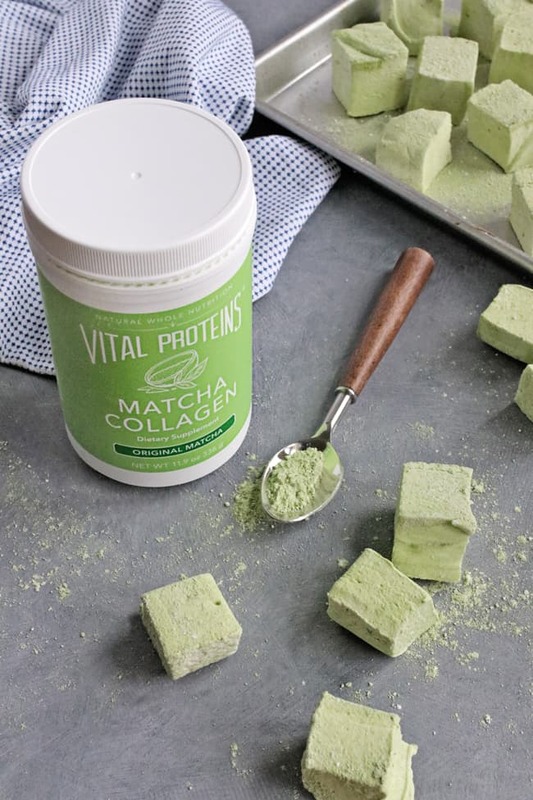 Vital Proteins Matcha Collagen isn’t just a tea. It’s a nutritional powerhouse made from high-quality Japanese matcha and grass-fed, pasture-raised bovine collagen. Just one scoop packs quite a nutritional punch, with antioxidants, L-theanine, and 9 grams of collagen protein in every serving. Plus it’s Whole30 approved and free of dairy, gluten, added sugars, and artificial flavors. Because Vital Proteins is the highest quality, you can be sure you are getting the best of the best. 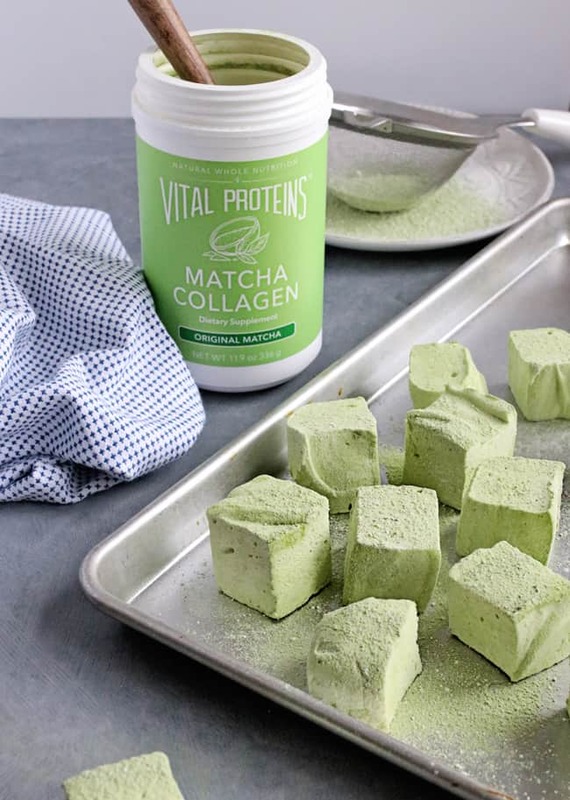 Collagen Matcha isn’t just reserved for marshmallows and lattes. 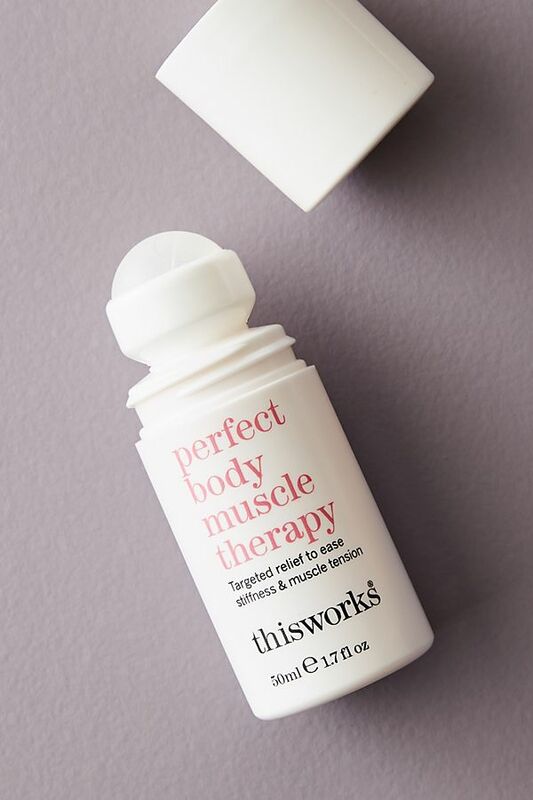 On days when I’m feeling lazy, I love adding a scoop to my morning smoothie for an extra dose of protein and antioxidants. This is especially helpful if you’re not a fan of the tea flavor. 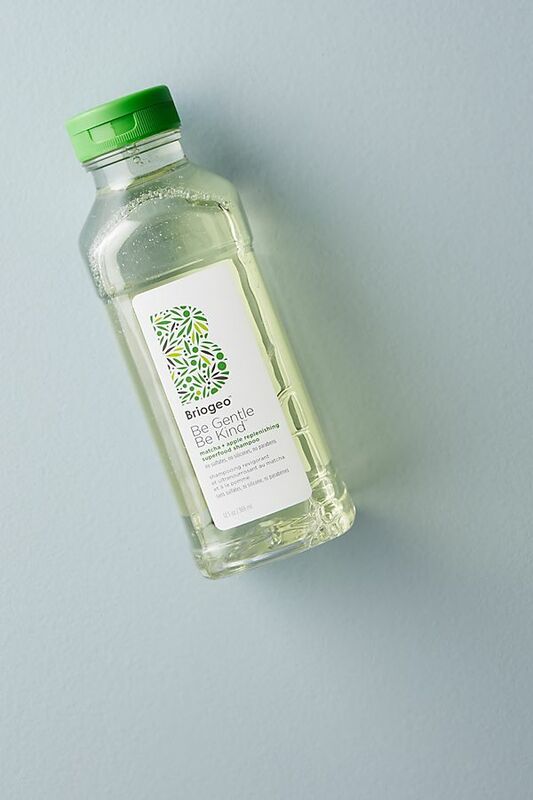 The powder blends smoothly and the flavor is so subtle you won’t even know it’s there. Now I want to be completely honest. My first few attempts at making marshmallows went a little, shall we say, less than stellar. 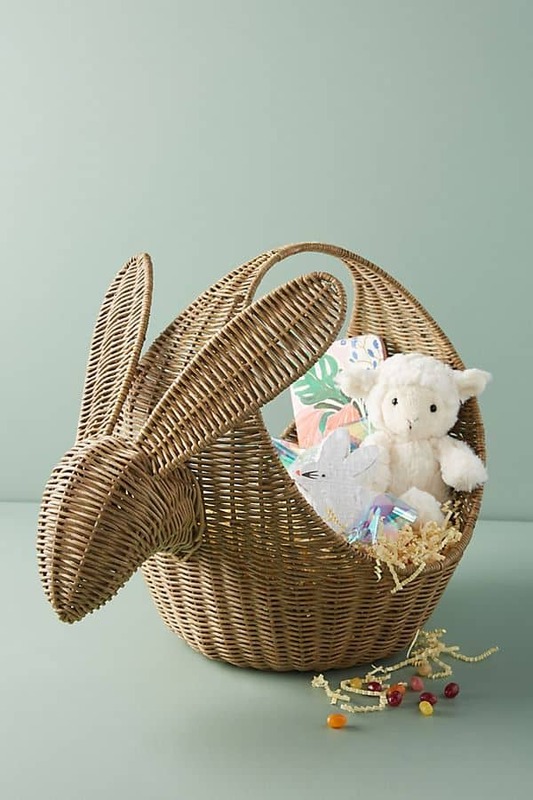 I know a lot of recipes tell you to use honey in place of the corn syrup and egg whites for a fluffier ‘mallow, but that never worked for me. They simply didn’t set up, no matter what I did (and I did a lot). 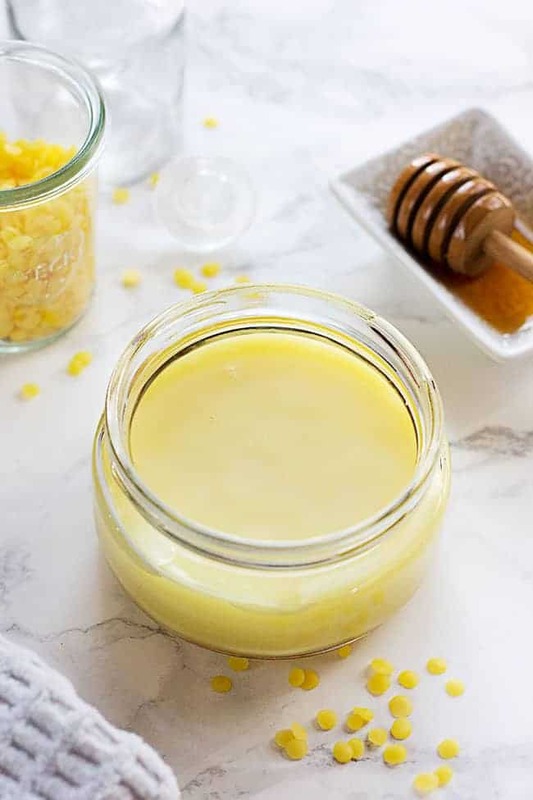 So your best bet is to simply choose the best quality corn syrup you can find and use just a little. Although high in sugar (but hey, shouldn’t marshmallows be a “treat” anyway?) this recipe is no-fail and my absolute favorite. Line a rimmed baking sheet with parchment paper. In a small bowl, combine corn starch and powdered sugar, and whisk together. Sift cornstarch and sugar mixture evenly over the parchment paper. Pour ½ cup water into the bowl of a stand mixer with whisk attachment. Sprinkle gelatin over the top and let it sit without stirring for 15 minutes. Meanwhile, in a medium sauce pan, combine the remaining ½ cup water, corn syrup, sugar, and salt. Without stirring, attach your candy thermometer to the edge of your pan and bring everything to a boil over medium-high heat. Let it boil for about 8 minutes, or until the thermometer reads 240ºF. When the sugar mixture reaches 240º, remove from heat. Working quickly, turn your stand mixer on low to whisk the gelatin. With the mixer still running, carefully pour the sugar mixture into the bowl. Turn the mixer to medium and continue whisking for 8 minutes. Without turning off the mixer, slowly add matcha 1 teaspoon at a time. Continue whisking an additional 2 minutes. Pour the marshmallow creme onto the prepared baking sheet. Spray a spatula with non-stick cooking spray and spread the creme as evenly as possible. Dust the top with more sifted cornstarch/sugar. Cover with parchment and allow to set up overnight. To cut the marshmallows, grease a knife with non-stick cooking spray and cut into large squares. Store marshmallows in an airtight container with a little extra cornstarch for about 1-2 weeks. Wooh! This looks amazing. Thank you so much for sharing this awesme receipe.